(8) Providence vs. (1) Louisville: The Fryers expended a lot of energy yesterday in a comeback effort against DePaul. They now must beat the Cards if they want to dance. The question now is what do they have left? Providence has scorers, the problem is shot selection. And going up against a formidable defense doesn’t help the Fryers’ chances. Expect fatigue and poor shooting to send Providence to the NIT. (5) Marquette vs. (4) Villanova: The battle of guards should be a classic. Both teams a bit undersized, but own the perimeter. 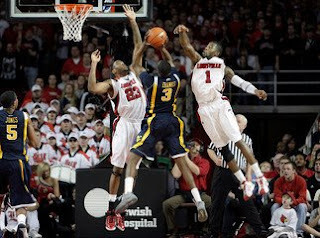 Not having Dominic James will haunt Marquette for the rest of this season, and could be the difference in this one. Nova also has a bit more experience. The teams did split the season series, but again without James Marquette is fighting an uphill battle. With all the guard talk it may be Nova forward Dante Cunningham who is the difference maker. (7) West Virginia vs. (2) Pitt: The Backyard Brawl Part Three. West Virginia has done a good job defensively against Pitt this season, but just aren’t deep enough up front. If DeJuan Blair can stay out of foul trouble expect a double-double. The Mountaineers will keep it close, but WVU killer, Sam Young will be the difference as Pitt pulls away in the second half. (6) Syracuse vs. (3) UConn: A great match up to close out the night. UConn dismantled the Cuse earlier this season, but the Orange seems stronger now down low. The big man battle could be epic, and the Huskies better get a physical Hasheem Thabeet tonight…which won’t happen. If Syracuse can get hot from the outside, and stay out of foul trouble then they have a great shot. Let’s call the upset here.